At first glance, the marble clematis (Clematis marmoraria) looks more like an anemone than it does a clematis. You would be forgiven by most for the mistaken ID because it is one of only a handful of the roughly 300 described species that do not exhibit a vining growth form. Also, they hail from the same family - Ranunculaceae. 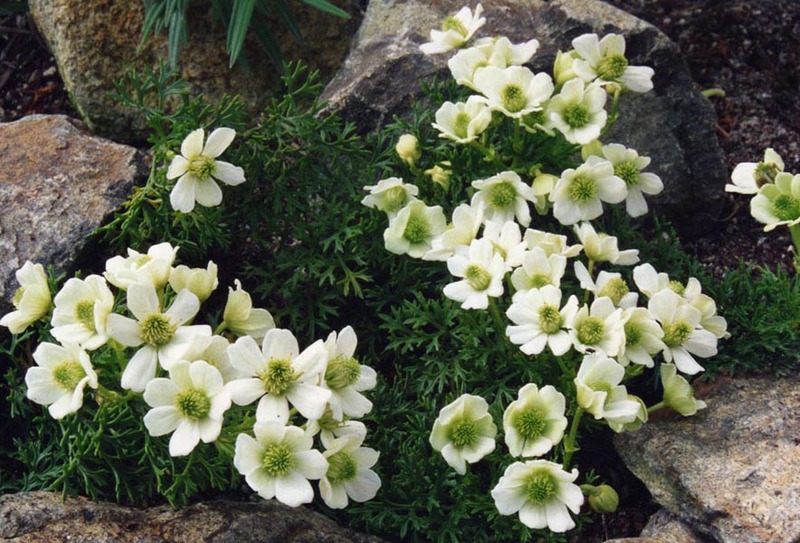 The marble clematis is odd in that it lives its life as a compact “shrub” that hugs the rocks of its alpine habitat. And compact it is! The marble clematis is the smallest in the genus. The marble clematis exhibits a very limited distribution. It can only be found growing wild in the alpine zone of two sites within Kahurangi National Park in New Zealand. It has only been known to science for a relatively short period of time, having been discovered in 1975. Subsequent investigations have been able to elucidate that its restricted to specific rocky substrates, mainly marble, hence both its common name and specific epithet were given to reflect that. Like many members of the genus, the marble clematis is dioecious, meaning individual plants are either male or female. Flowering begins in December, as the southern hemisphere summer kicks into high gear. Being restricted to an alpine habitat means that this species has to pack growth and reproduction into only a few short weeks before nasty weather returns and buries it under snow. Despite its herbaceous appearance, the marble clematis is more accurately described as a sub-shrub as it attains a rather woody habit as it matures. Other than its size, the fact that it is not a vine may be the most striking feature of the marble clematis. It is likely that natural selection simply doesn’t favor vine-like growth in such rocky terrain. There really isn’t a whole lot of neighboring vegetation to climb on and compete with so why both with an ambling habit? Also, its alpine environment doesn’t lend well to tall growth. Anything that scrambles up and over rocks is likely to be damaged by wind, sun, and freezing temperatures. As such, the marble clematis is more at home tucked into nooks and crannies than it is vining all over the place. Unfortunately, its small size, slow growth rate, and limited distribution seem to be working against the marble clematis in our human-dominated world. Not only does climate change threaten its alpine habitat, human activity coupled with grazing by introduced goats and deer have seen populations of this unique species decline at an alarming rate. In 2009 the marble clematis was afforded ‘threatened’ status and is now considered Nationally Vulnerable by the New Zealand government. However, there is a silver lining to all of this and it lies in the hands of alpine garden enthusiasts. It turns out, the marble clematis is fairly easy to grow. Together with its compact form and showy flowers, it has gained a lot of popularity among horticulturists and gardeners that enjoy rock gardening. Plants can easily be started by seeds or cuttings and, provided some basic soil needs are met (plenty of drainage), potted individuals can live long, healthy lives. Having plants in cultivation like this means that the risk of complete extinction is greatly minimized. Of course, ex situ collections are not a substitute for habitat conservation but it certainly helps mitigate at least some of the risks facing species like the marble clematis.